The Tourism Authority of Thailand, local tourism businesses, travel agencies and representatives from the eastern region of Thailand jointly organised a recent roadshow to publicise tourism in Trat, Chantaburi and Rayong provinces amongst northern Thailand residents. 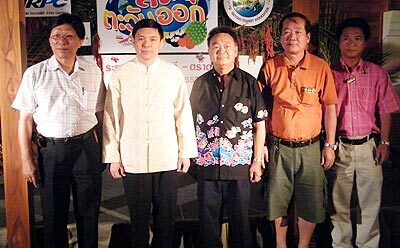 The event, held at the Ratilanna Hotel, was presided over by deputy Chiang Mai governor Chuchart Kilapaeng, (2nd left). Dewar’s ‘Present Welcome’ party, a ‘thank you’ for its clients, was held August 1 at the Tarabar Pub & Restaurant on the Lamphun Road. Entertainment was by Sumet and the Punk mini-concert, and included talk shows, with the raffle prizes and lucky draws sponsored by Bacardi (Thailand). Members of the Newspaper Editors’ Network from 17 Northern provinces, together with representatives of the Regional Newspapers Association, led by National Press Council committee member Banharn Boonkhet, are welcomed by deputy director Phanthip Lertpradit on their August 5 visit to the Night Safari. Amnuay Wanpen, (left) and Sawanya Pongpamorn, (right), the Royal Princess Hotel’s manager and sales manager present a souvenir panda to Roger Smith and his daughter from England as part of the hotel’s ‘Hello Baby Panda’ promotional package. Mr Smith and his party were the first guests who booked using the promotion. 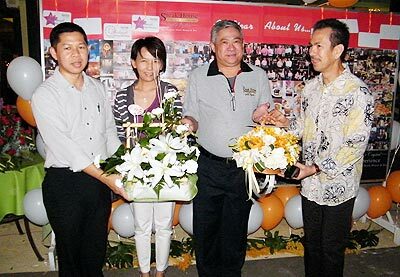 Ritdamrong Ditsakul na Ayutthaya, 2nd right, CEO of the Steak House Restaurant at JJ Markets, and its MD Kitti Changpiam, left, pictured welcoming guests to the celebration of the restaurant’s 1st anniversary. The Steak House, under Le Crystal’s brand, serves quality steaks, international food and desserts at good prices and opens daily between 10 a.m. and 1 a.m.
Prachan Hunchianao, pictured left, branch manager of the Thanachart Bank, together with guests, all ready to dance the night away to the sounds of classics, 1970’s and house music after the recent Banking Networking Evening at the Shangri-La.